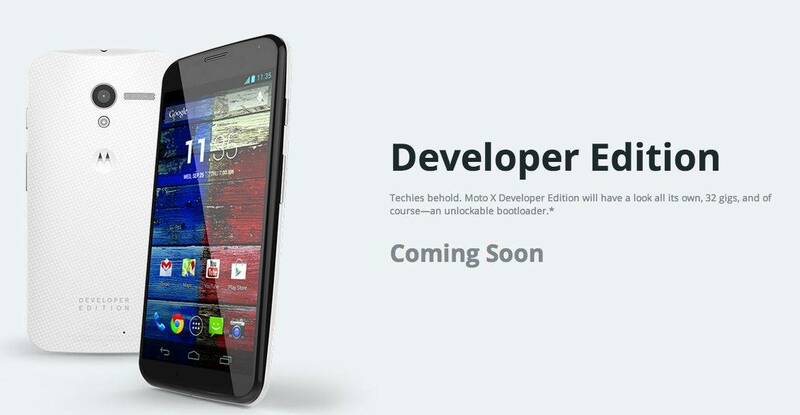 Motorola has updated its official Moto X “Ways To Buy” web page, showing off its brand new Developer Edition of the Google-owned company’s flagship smartphone. This limited edition version of the handset features a black front panel combined with a white woven backplate, inscribed with the words “DEVELOPER EDITION” on the bottom. The stock Moto X packs a 4.7-inch AMOLED capacitive touchscreen, a 1.7GHz dual-core Qualcomm Snapdragon processor, an Adreno 320 GPU, 2GB of RAM, 4G LTE capabilities and a 2,200 mAh battery. Whereas the Dev Edition will house all of the above standard specifications, as well as 32GB of internal storage and a fully customizable unlockable bootloader. The web page also quotes that this special version of the Moto X will “have a look all its own,” thus meaning that the two-tone color scheme is completely different to what you’ll find on its basic carrier models. However, once the MotoMaker website is fully opened to all and ready for business, you could build a similar device to the Developer Edition if you so wish. We have no information with regards to pricing or availability, as of yet, we simply know that the device is “coming soon.” We will be sure to let you know as soon as we have any more information.